A strong, positive social media profile can help you get noticed by potential future employers. How confident are you that your online presence is setting you apart from the rest of the field? Try this tool now to find out. 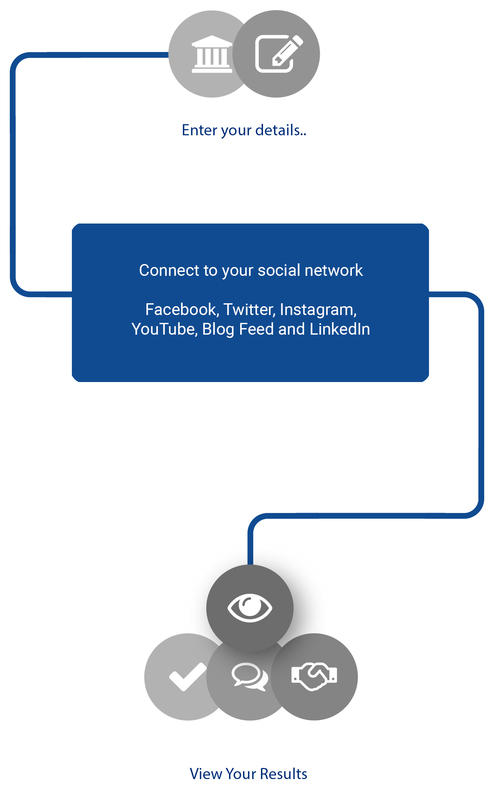 Follow our simple wizard which will guide you through the process of connecting your social media accounts. Don't worry you can skip any you don't have! Click the button and in moments your public social media posts, photos, videos and more will be presented to you in a clear and concise format, with quick tips from our careers department. Are you happy with what your public social media is saying about you? Review your results. Once you've finished using the tool, you can follow our sign out wizard to disconnect from your social media accounts. Please note, no personal data or information is kept once you exit and clear results. Please use private or incognito mode in your browser for added security. Connecting to instagram will show any publically avialable data for your username. It looks like you didn't connect to any social networks. Do you want to try again or continue? Thanks, you are now signed out of all your social media accounts! If you're finished please remember to close your browser or click here to start again. Firstly, ensure that your profiles can be seen by people you would like to see them, check privacy settings on all your social media site. Be aware that having everything closed can be seen by some employers negatively, it could be viewed that you have something to hide and this could potential work against you. Make wise choices about what you want people to see from your accounts to ensure you are showcasing and maximising your potential. Think about your strategy here – what do these profiles say about you? Do they reflect a character that you want to be available to potential employers? Are they old profiles that need updating? Do they showcase you in the best way possible? Include your career, industry or sector passions, what you are excited about and the aims for your future. Use your profiles as an elevator pitch – concise, confident and showcasing your experience, qualifications, personality and character. Do you have profiles for each of your accounts? Do the profiles match up? If not, worth amending or adding in any missing descriptions. Use a good quality and clear photo for your profile – don’t forget to smile! Having this will encourage engagement with your key audiences of employers and industry specialists. Explore your privacy settings and ensure they are right for you. Check back regularly as these settings can change, so make sure they are up to date. Use the settings to choose if you want posts to be made public, think about how these posts showcase you to a potential employer. Limit the audience of your old posts, use the settings to hide things you have posted in the past. Also ensure you are happy with posts you are tagged into as well, are these what you would like to be associated with you? Post and blog about what you love and your interests, this can showcase your passion for industry or career sectors. Potential employers will be impressed by seeing this on your posts and ensure you are happy with the presentation – employers will use posts to see how you write, spell and present your passions. You may have a username that has been around awhile, so always worth reviewing these for your accounts. Could they do with a slight re-adjust to reflect you now? Aim to keep usernames simple and keep these in line with your name. To change you username go into the setting section on your social media account. Simple usernames that. It is good practice to keep your name consistent throughout all your accounts. You may find some of your accounts use shorter or “nickname” so aim to change these to your full name. There is no confusion when an employer finds details that it is your account and they are not seeing a name that you would rather not be visible to anyone but your friends! Who are your followers? Are they the right accounts or people you want associated with your profile? Evaluate these to ensure they are what you want to be linked with. If you are posting some great items but no one is seeing them, make sure you build your connections and get those to follow you. For those you want to be your followers, aim to engage them in your posts and encourage interest in your career area or interests. Ensure you link to relevant people in organisations or industry leads for your career area or interests. Be prepared to post topics, pose questions or blog about your interests to encourage engagement from these followers. It will be much more powerful if those followers are engaging with you. Networking is a key part of building your career and social media networking, those you follow and interact with on social media can be a great start for you to progress. Ensure that photos from your recent social activities are not the only ones that are shown! Ensure that you show a good range of photographs to reflect your interests and passion for industry or your career aspirations. Include photos of interests and activities. Employers do not want to hire robots, so showing you have passions outside of study and work will give you character. Evaluate all videos you have uploaded or viewed on your Youtube account – it may surprise you what is publically available! Are these the right videos to showcase you? Are there any specific videos that need to come off your account and instead look to favour those related to your career industry, your course and your interests. Review your account to ensure they reflect what you want others to see. Copyright © 2019 Digital Education and Student Life, University of Lincoln.